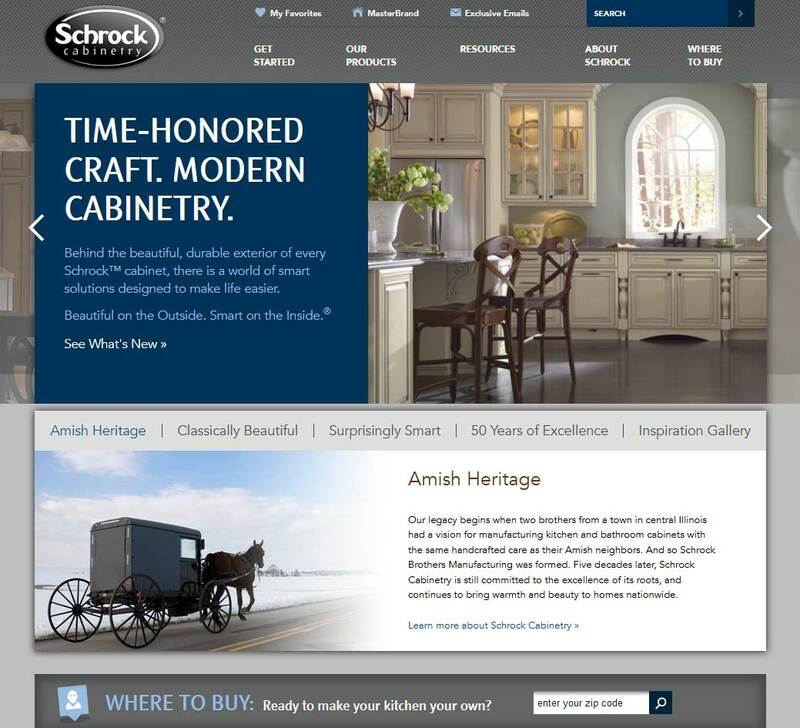 Schrock Cabinetry was founded in 1961 in Arthur, Illinois as Schrock Brothers Manufacturing, specializing in beautiful handcrafted cabinetry. In 1998, Schrock became part of the MasterBrand family of great people and great brands. Today, they continue to focus on a great future that is firmly rooted in superior knowledge and expert craftsmanship that will carry Schrock Cabinetry well into the next 50 years. make. Helping families turn their dreams into reality is at the heart of everything Schrock do and everything they are. Their legacy has been proven time and again with outstanding quality, dependable delivery, and superior service. And, although trends may change throughout the years, their fundamental mission and core traditions will always remain the same. 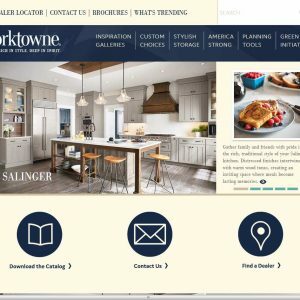 They invite you to explore Schrock Cabinetry for the latest in creative and convenient cabinetry solutions, and to trust the Schrock name for expertly crafted cabinetry that is sure to stand the test of time. Coupled with the financial strength and stability of Fortune Brands, Schrock and Masterbrand Cabinets is a powerful force in the kitchen and bath industry. With Fortune Brands’ support, they are a future looking company concentrating their efforts on success and growth. 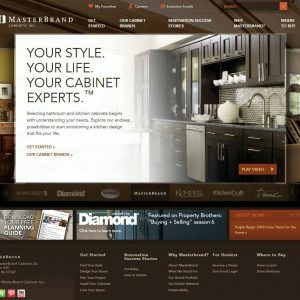 Schrock Cabinetry are part of the Norcraft/MasterBrand group and are based out of Jasper, Indiana. We purchased Schrock Select Bayfield Oak design for our small kitchen in June 2017 from Menards in Crest Hill, IL. Installation was good and fit the design plan perfectly. BTW, the function and quality are great. These middle of the road cabinets are just what we wanted and provide us with the space and elegance we expected. Sad that Menards stopped selling the line we purchased. 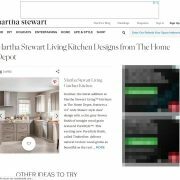 If we want to add on to our kitchen design, we’ll have to either improvise or go to another seller to get what we want. If you know what you are doing, you won’t have any problems will this product. Shame on you Menards, you listen to way too many people who don’t know how to install a project correctly. Sometimes the customer is ignorant. 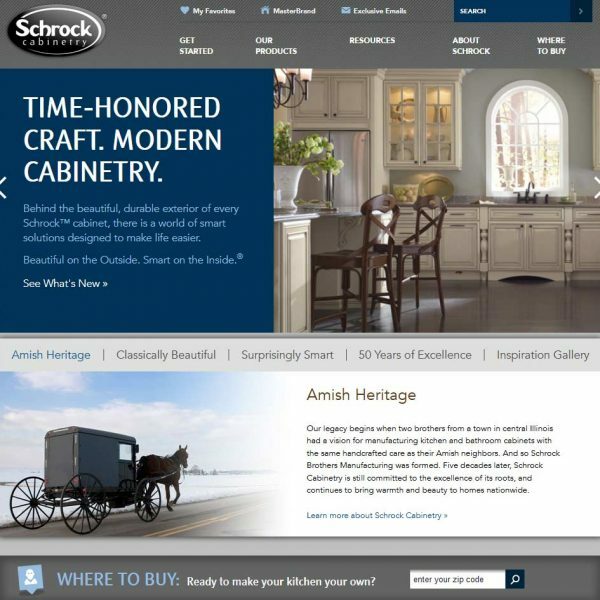 I purchased Schrock cabinets in 2007 when we re did our kitchen. Maple with butternut glaze finish. The glaze started peeling within 2 year, had them out and they “painted” and replaced the top piece of the cabinet under sink. The kickplates if you will are all peeling likely from mopping my floor and around the knobs as well. Like the post above says…these are good as long as you don’t use your kitchen. I don’t even wipe down cabinets nearly as much as I should due to the fear that the paint will peel which it has already started doing. SO ridiculous. I would have gone with solid wood with no glaze finish if I had any idea this would occur. My sister in law purchase similar cabinets with a glaze finish and has had zero problems with hers…the only difference is they are a different brand. I purchased them with a lifetime warranty. I am demanding a new kitchen because clearly these products are defective and I do not want to be calling them out everytime something else starts to peel. Wish we had read the reviews before ordering our kitchen. Paid full price for cabinets that look like they came from a seconds store. Very disappointed and unhappy, will never buy from this company again. All my drawer fronts look like they have been pieced together with scraps. reordered six times and they send the same awful looking drawers right back. The workmanship is deplorable. Feel like we were plainly miss represented. Samples in store look REAL nice. Very deceiving. Ordered mine from manards. To many problems to list. I dont think they even look at the cabinets before they ship out. Poor quality!!! I spent over 10k and am deeply regret purchasing through menards/shrock. We purchased Schrock cabinets 30 years ago for another house we had and liked them, so we again purchased them and what a sloppy job they are doing. Looks like they used scrap lumber to make doors. Had several replaced and they also were as bad as first. After the third time we decided to get custom doors made. Would not recommend anyone purchasing Schrock cabinets. I built my home, with Schrock Cabinets, because at the time, they offered a “lifetime” warranty; and I really liked the look of them. I also thought that Schrock was a quality name brand. I have spoken to the representative at Menards (where, I purchased them at). However, my builder, at the time warned me not to purchase Schrock cabinets!! I went against his advice; because I loved the look of the hickory planked cabinets. I have told the Rep at the local Menards, however, he said he could have a Schrock Representative come to my home and look at them. I am fine with that, however, was never contacted back. After doing some research, they don’t even sell these anymore because they HAD a warping issue. This is the biggest part of the problem I have. Most all of the hardware, and hinges have broken. They dont close correctly, etc…. I still havent gotten any contact or results from this company. All they have told the Menards Rep is that they “don’t make this kind any longer”. But they DO have other Hickory cabinets.. because I’ve seen them at the local Menards. They have all of the order information they need. I spent a lot of money on my new kitchen! !, my one and only newly built home; because I wanted quality cabinets, and a company I could trust if there were any problems. They should be able to contact me and replace them with another Hickory cabinet they do still carry, and is on display at the local store and in the large catalog. Obviously, because they don’t make my particular cabinet style,(due to the warping issue), they do have a Hickory they sell, called “Rustic Hickory Portage”. They would not need to replace the base of any of them, because they are also hickory, however, they could replace the warped doors and drawers. Some overlap each other, some are just plain warped, and some dont even close. I really wish the company would stand behind their products, as they say they will, and would honor thier warranty!!!! Many of the doors are not even square!! I definately would not purchase Schrock again, unless they make it right!!! Thank you for your time and consideration. I have recently had my kitchen re-done with Hickory cabinets from Schrock. The store that recommended them insists that they are a quality product. I have had endless problems that are too numerous to tell now, and the issues are not over. I also do not trust the finish, the workmanship is shoddy, the look is cheap, and as far as customer service from Schrock itself, I am about to find out what they will do as I am amassing my evidence and will submit it tomorrow. Wish me luck! Spent thousands of dollars redoing our kitchen with Schrock cabinets from Menards. I couldn’t be unhappier with them. The shaker style doors are falling apart after 3 months of wear, there is absolutely no excessive use, they are opened and they are closed, and this morning one piece of the cabinet fell completely off. There is absolutely no way to contact Schrock for customer service issues. I feel stuck with 4000 dollars worth of cabinets that are bound to fall apart door by door. I am disappointed, to say the least. I ordered my Schrock Select cabinets in March and am still dealing with defects in September. 5 of 12 cabinets had to be returned and replaced, and of the remaining cabinets, not a single one is issue-free (neither are the replacements). Among the issues: hardened glue on the outside (viewable) areas of cabinets, scratches (some up to 8″ long), dents, scrapes, splintering laminate, boxes not level, drawers not level, doors not square, doors different sizes, screws in hinges on an angle and stripped so I can’t adjust door placement, base cabinets at different heights (off by up to 1/2 inch), poor drawer slides give that wood-on-wood sound, doors & drawers different colors, obvious “repair marker” lines on all cabinets. I wish I could include pictures in my review. My “new” kitchen is going to look worse than the previous 60-year old kitchen! Luckily the store I purchased them from has worked with me on replacing full cabinets and pieces (doors, sides, etc. ), but not very happily. The Cabinet Dept Mgr tells me I am the only customer to have problems with Schrock cabinets (I assume he’s not allowed to admit anything different) and infers that I am being too picky, while the people in Special Order Pick-up (where I have to drop off the defective and pick-up new) tell me they see these cabinets returned constantly (but, “I didn’t hear that from them”). I would not recommend these cabinets to anyone. I also would not recommend listening to store employee advice or views. Do your research before buying – I wish I had! We installed Cherry cabinets in our kitchen and a couple years later the finish started peeling off in the cabinets around the sink area. I realized that these are from water that sometimes drips onto the cabinets, but I’m not a slob, and don’t let it sit there. I don’t have this problem with cabinets in the bathroom that are subjected to more water. Also, they seem like they are easily scratched. I would not purchase them again for this reason alone. I have a newly built home with Schrock entra cabinets in the Kitchen. It has nails popping everywhere inside and out. I have so far got pricked of these nails several times and in fact blood has come out. The worst cabinets that I have used in my lifetime. I would not recommend this at all. As a builder the I have noticed that the quality of Schrock cabinets has arrived in the dumper. The assembly and finishes are shoddy, the materials are not as advertised, they are assembled out of square, the hardware does not function well, cheap, the assembly system for the doors is disturbing and does not let the drawer close flush with the doors and allows the door fronts to warp. Minus five stars, that’s the opposite of good and products like this are usually only found in a homeless person’s cart. I am having the same issue with finish wearing off around the bottom and tops of the doors and around the hardware. I have not called yet to report it to Shrock but it is very bad. I speant roughly $25,000 and got solid cherry doors but the ebony finish is flaking off. They look horrible at 4 years old. DON”T BUY THIS CABINET! Spent $20000 4 years ago. The finish is wearing around the pulls which are Schrock pulls. The finish is coming off in the bathrooms and on the sink cabinets. Shrock will not honor its warranty because the “engineers” say it is our fault. Apparantly, you should only buy Schrock cabinets if you are not going to use your kitchen or bathroom. Stay away far, far away. We spent over $5000 on new cabinets (we didn’t buy a lot of cabinets) in April of 2007. We installed them ourselves. They look beautiful, however the hinges and other hardware is faulty. Screws pull out of hinges, or aren’t even long enough. While everything functions well, my husband has had to replace and fix hinges and screws several times. Do not even consider buying these cabinets. The finish is barely there in some places. The glaze is terrible–looks nothing like the door sample that caused me to select it. Worse, the rep came yesterday; and he says this is their normal look. I had taken one of the drawer fronts to a dealer other than the one I was working with; and she said it looked like someone had done it in their garage. The rep claims this is what all of their cabinets look like in the finish I chose with the glaze I chose. The drawers are rough where they are dovetailed; and the cabinets are not at all worth the money I had to pay. My review written yesterday was not posted. I paid for these cabinets through a Schrock dealer. I did not want them installed in my home because the finish was so bad. The dealer had Schrock tell me that I had to have them installed in order for the Schrock rep to determine if there is a defect in finish. They were installed and the dealer then told me that I had to get my entire bathroom completed before the rep would come. I didn’t fall for that; however, the rep did come and claims that the unfinished places on my cabinets are not factory defects but have that the finish has been rubbed off. I told him I would use the marker provided by Schrock to cover those places since he refused to admit that there were defects. Only problem is the marker doesn’t stick to the unfinished places because the factory glazed over the places on the cabinets that were never finished. 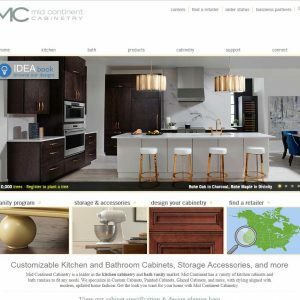 So, I have cabinets that are not quality and the warranty is actually no good. The rep is standing behind his dealer. Important: all reviews for Schrock Cabinetry should comply with our review policies here.